Percentage of total minutes played returning to the Ducks. Context? Last year they returned 24% from the season prior (three players). This is the most amount of returning minutes Dana has seen since joining the Ducks. PacHoops: This is seemingly one of your most contiguous lineups. Has that changed the way you’ve been able to prepare for this season? DANA ALTMAN: A little bit, just, you know, with Elgin’s experience, Dwyane’s experience, those two seniors coming back, Dillon Brooks, Casey. Jordan is injured right now, so he’s not practicing, but that does give you a tremendous core to work with. Dylan Ennis, a fifth‑year guy, has a lot of D‑1 experience and he’s been easy to work with. I think we’ve got a group that hopefully will make progress, and we still have a lot of new faces to work in. That’s the exciting thing. We’ve got three talented freshmen that I think will be pretty good, a junior college transfer. I think our new guys, and I think we can make progress with them. 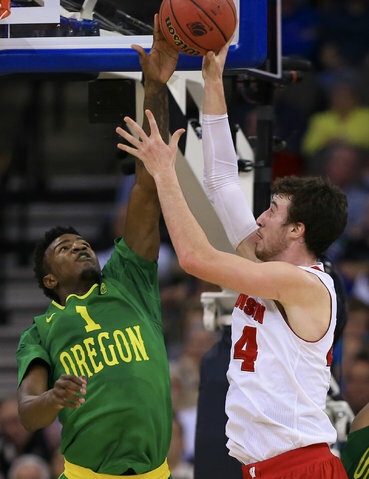 Jordan Bell just blocked your shot. The loose ball is snatched up by Dylan Ennis who’s already two eyes up the court. He understands he has Tyler Dorsey drifting for a corner three. He also knows he has lane he can create on his own or he can find Cook streaking for the easy slam. That’s what an Altman offense + defense could mean. Not only do the Ducks win the conference, but they’re unanimously the most fun team to watch. With a full roster (and a shorter shot clock), Dana’s trap zones are wildly effective. Offense + Defense = Sweet 16.